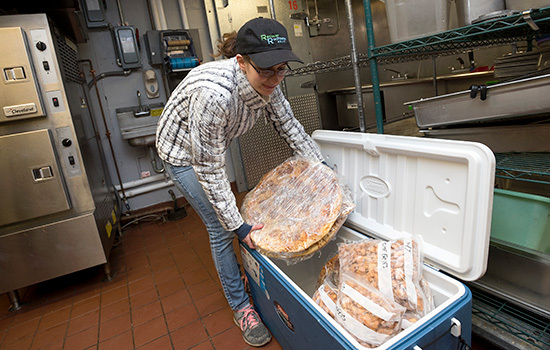 Katherine Larson, a member of Recover Rochester, collects frozen food from RITâ€™s dining facilities to donate to local food centers in Rochester. Several times each week, students in RIT’s Recover Rochester club collect unused food from dining facilities, load it in coolers and use a Student Government van to deliver it to three meal centers in Rochester. Recover Rochester started its deliveries in December 2012 to also help eliminate wasted food. So far, they’ve donated more than 75,000 pounds that would otherwise have been thrown out. The process begins when the dining facilities freeze food that has been cooked but not sold. Some of the 30 members of Recover Rochester take an inventory. The following day, other students collect and distribute the food to either Blessed Sacrament Church, Asbury United Methodist Church or the Open Door Mission. The process also helps the dining facilities know how much extra food they are regularly preparing and cut back if needed. The club is one of 230 chapters of the Food Recovery Network, which issues guidelines on what can be donated and how the food is handled. On one collection day, students wearing hats and attire emblazoned with the Recover Rochester logo walked through the loading docks of various buildings on campus and took freight elevators to get to the kitchen freezers, where the donated food was waiting. They loaded the van with pizza, pasta, cookies, muffins, meatballs, quiche, chicken fingers, grilled chicken, pies, doughnuts, home fries and lentils, plus several huge bags of pretzels and more than six pounds of popcorn leftover from concession stands. Making a delivery, Jordan Jock, a second-year computer engineering major from Phoenix, N.Y., pulled into the parking lot of Blessed Sacrament Church, which feeds 100 to 130 people a day at its supper program. In May, Recover Rochester was recognized by the Center for Campus Life with the first Club Community Service Award, for being the Student Government-recognized club with the most hours of community service. More than 670 hours were logged by its members. Club President Corey Wrigley said they are talking with students at other area colleges to help them set up similar programs. Jock first joined Recover Rochester because he wanted to volunteer when he came to RIT. “I heard about the club and I liked what they did and the fact that they make a direct impact with the community, and RIT,” he said.